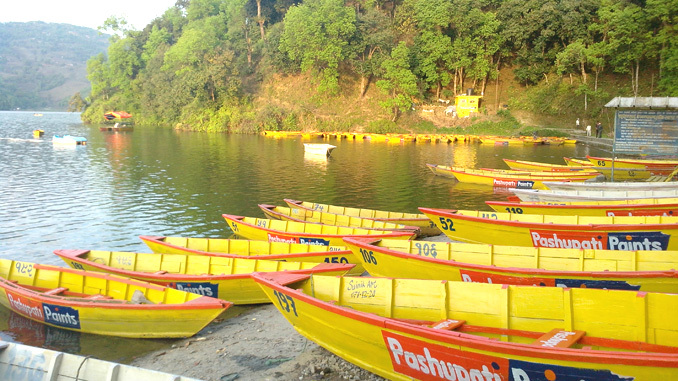 Pokhara—Five persons went missing when a boat they were rowing capsized at Libdi Tunda in Begnas Lake in Pokhara Metropolitan City, Kaski on Saturday. According to District Police Office Kaski Spokesperson DSP Rabindra Man Gurung, two women and three children drowned in the lake while four others- two men and two women have been rescued by the boat entrepreneurs and local people. The condition of two of the rescued is said to be critical. They are getting treatment in local Lekhnath Lions Community Hospital. The boat travelers were on their way to a in-laws house across the lake to have Dar, a special food that is eaten on the occasion of Teej Festival of Nepal. The boat met with an accident as it traveled half of its way in the middle of the lake. The search of missing is undergoing and the cause of the accident is yet to be ascertained. However, it has been said that the boat went unbalanced and capsized when travelers tried to save an accidentally fallen children. -Jamuna Kandel of Tanahun also has been declared dead in hospital. -Kamal Raj Kandel who traveled in separate boat went unconscious and other two Nisha Paudel and Sapana Khanal are getting treatment at Lekhnath Lions Hospital.